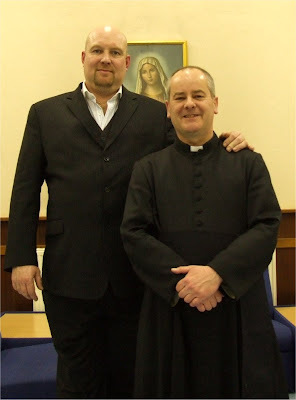 John Pridmore came to Blackfen this evening and spoke powerfully about his conversion from a life in which he had everything in worldly terms but was empty spiritually, to a life in which he found the love and forgiveness of our Blessed Lord. We heard a fuller version of this journey of faith this evening, as well as a number of other inspiring stories illustrating aspects of the Catholic faith and life with a strong emphasis on the importance of a living and personal relationship with our Lord. We heard about Bl Mother Theresa, about the importance of the Blessed Sacrament, the power of the Sacrament of Confession, the importance of the teaching of the Church, the emptiness of the glamour promised by sin, to give just a few examples. After John, eighteen year old Will spoke about his own life and conversion, the emptiness that he had known through crime and drug-taking, and the happiness that he found in knowing Christ and being baptised into the Catholic Church. I was delighted that the Church was full, with many young people coming along for an inspiring evening. John spent a long time afterwards talking to youngsters and encouraging them in the faith. People were able to buy copies of his great books "From Gangland to Promised Land" and "A Gangster's Guide to God".